Let a senior, one who is skilled in gaining souls, be appointed over him to watch him with the utmost care, and to see whether he is truly seeking God, and is fervent in the Work of God, in obedience and in humiliations. Let all the hard and rugged paths by which we walk towards God be set before him. Saint Benedict’s sollicitus can mean careful for, concerned about, punctilious, attentive, diligent, and eager. Going to choir for the Opus Dei is the first and foremost expression, of a monk’s sacrificial gift of self to God. It is an act of gratuitous praise. There cannot be any calculated, measured, or reticent about a monk’s commitment to Divine Office; he goes to choir wholeheartedly, without delay, and for God’s sake. He will obey Saint Benedict’s injunction in Chapter XXII: “Hasten each to forestall the other in going to the Work of God”, and “When they rise for the Work of God, let them gently encourage one another, because of the excuses of the drowsy”. Thus will a monk fulfill the great principle of Saint Benedict in Chapter XLIII: “Let nothing, then, be preferred to the Work of God”. The choir–stall is not far from the altar, that is, the place of immolation, and this significantly so because the choir–stall is the place from which a monk habitually participates in the sacrificium laudis, Christ’s priestly offering of praise to the Father. 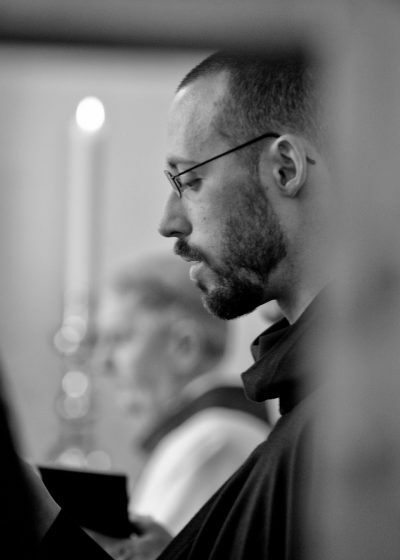 It is only fitting that at certain seasons and hours of his life, a monk experiences the Divine Office as his servitutis pensum, that is, as his bounden duty of divine service. The Divine Office is costly: it costs a monk time, energy, and the expenditure of his very breath. Romantic notions of hours spent blissfully in choir give way, over time, to a humble fidelity hour by hour and day after day. 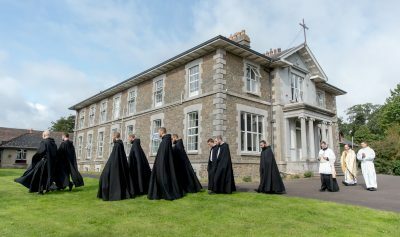 The priority given to the Opus Dei in Benedictine life and its incalculable value for the individual monk, the monastery, and the whole Church, demands of the Benedictine novice an unconditional readiness to make whatever personal sacrifices are required in order to carry it out faithfully and unstintingly. Thank you very much for this clarification of the word “fervor”. I think I my temperament is more melancholic, therefore I rarely have “embulient enthusiasm”. I have read many old spiritual books where the word fervent is often used especially in ” fervent prayers and supplications.” I have always felt somewhat saddened when I’ve read that as it just doesn’t fit me, and I have thought that there was something wrong with me. The word “sollicitus” is a better fit. I was also reading the entry about the ancient form of meditation compared to the more modern form today. Again my mind and heart were eased as I just haven’t been able to get into the modern form, again thinking there is something wrong with me. I am drawn to the ancient form and am looking forward to trying it – maybe even with “embulient enthusiasm”!